Volume 5, Edition 6 Trouble loading? View this email online. CSUN’s Younes and Soraya Nazarian Center for the Performing Arts opened its season with a stirring performance of Amadeus Live, featuring the Oscar-winning film accompanied by the Los Angeles Chamber Orchestra and members of the LA Opera Chorus. 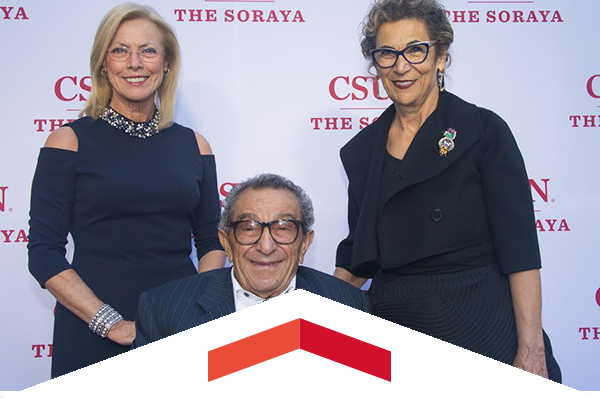 But first, the sold-out crowd celebrated the award-winning venue’s namesakes, whose transformative philanthropic support ensures that The Soraya will remain a jewel in Los Angeles’ thriving arts scene. 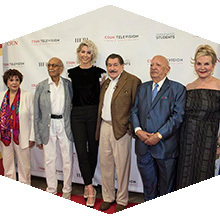 HFPA senior panelists were on hand to tell Jenna Elfman about their brushes with Marilyn Monroe, Alfred Hitchcock, Marlon Brando and Bette Davis. The HFPA’s $2 million donation to the Department of Cinema and Television Arts is considered an investment in the voices of a diverse group of future filmmakers. 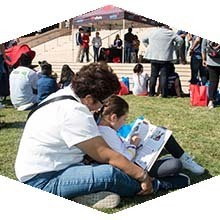 Thousands of young Latinos and their families can discover paths to success at Feria de Educación, a daylong celebration of the power of education to positively change lives. The free Feria is scheduled to take place from 9:30 a.m. to 3 p.m. in areas and buildings around CSUN’s Delmar T. Oviatt Library, located in the heart of the campus. Wajdi Mouawad’s beautiful, sorrowful play about the legacy of anger and the cycle of revenge and war. Twins Janine and Simon journey to their mother’s war-torn homeland in the Middle East, hoping to solve the mystery of their origins. Playing multiple dates in the Experimental Theatre at The Soraya. Sat, Sept. 23, 7 p.m.
Help the Matadors open home conference play by cheering them on against the 49ers. The Upright Citizens Brigade comedy group helped launch the careers of numerous TV and movie stars, including former Saturday Night Live star Sasheer Zamata. Now Zamata brings UCB alumni for a one-of-a-kind reunion performance at The Soraya. Jack Kirby, who co-created Marvel characters including the Fantastic Four, X-Men and the Hulk, is honored at an exhibit in the Oviatt Library. The collection includes rare comics from the 1940s and 1950s, as well as early issues of X-Men, Avengers and Black Panther. After gaining freedom and sobriety in 1997, Susan Burton made it her goal to help other women walking in her shoes. This free presentation will be held in the Whitsett Room (Sierra Hall, 4th floor) from 2 to 3:15 p.m.
Make the most of Open Enrollment (now through Oct. 6) and join us at the Annual Benefits & Wellness Fair to visit with benefit vendors and campus partners who can help you with your health and wellness goals. Join us from 9 to 11 a.m. for the fair and stick around for a tour of the SRC and Oasis Center. Then Walkability Wednesday starts at noon. Join the Office of Research and Sponsored Projects for Finding Success with an NIH R01, a webinar presented by Karen Briski, professor, University of Louisiana, Monroe. Free to faculty and staff and up to three guests, come enjoy an afternoon of fun and excitement. The Fall 2017 Faculty & Staff Series includes six home events on campus. For attending four of the six designated games, participants will receive a #OneMatador polo shirt. Join a panel discussion of David Yeager’s model for Sources of Psychological Friction and how we can customize his work to reflect challenges often faced by new students here at CSUN. Yaeger delivered CSUN’s 2017 Terry Piper Lecture: The Psychology of Academic Achievement: How Belonging & Mindset Influence Student Success. In this newsletter: The theme for this year’s Sustainability Day (Oct. 25) is Sustainable Food Systems, in support of World Food Day. Hear speakers from food justice organizations throughout Los Angeles, take a walking tour of campus to learn about edible plants found around our school and see a cooking demonstration. Also: learn about CSUN’s water bottle refill stations. The next Education on the Edge speaker will discuss an approach to curriculum that minimizes educational barriers and helps students utilize their abilities to absorb knowledge. Katie Novak, assistant superintendent for the Groton-Dunstable School District in Massachusetts, will discuss Universal Design for Learning (UDL) — a framework that helps improve teaching and learning for all people. CSUN students will give dramatic readings from banned books. Genderqueer guest author Alex Gino will read from their middle-grade book George, in which the titular transgender protagonist wishes to play Charlotte in the class production of Charlotte’s Web. Newsome, who gained national attention when she climbed up the flagpole on the South Carolina State House grounds in 2015 and removed the Confederate flag that flew there, encouraged CSUN freshmen to be unafraid, to stand up for their beliefs and to walk their own paths.